Look around you, look at all the unhappy people with their tiny engines. Cadillac CT6s and Subaru BRZs with their pathetic little 2.0-liter four bangers. McLarens running around with puny 3.8 liters, an insult to the V8 configuration. No, my friend, what you need is DISPLACEMENT. Only then will you achieve TRANQUILITY and INNER PEACE. What you need is this naturally aspirated 7.0-liter, modified LS7 crate engine from Mercury Marine. And, yes, I do mean the boat engine company. 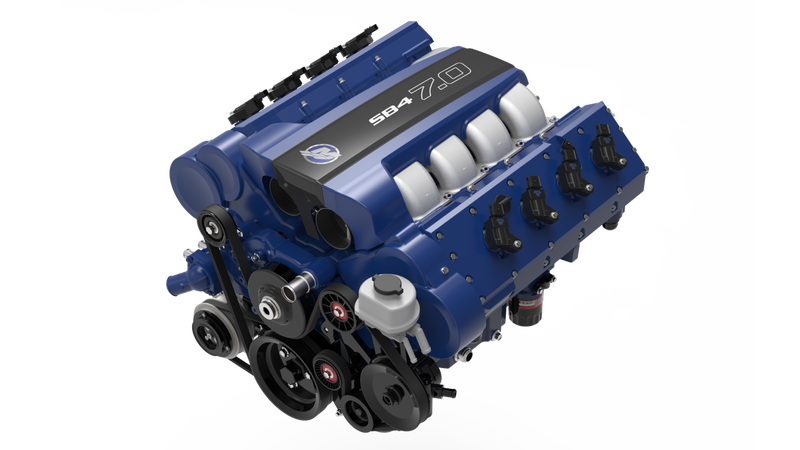 What Mercury did was take an LS7 V8 crate motor from GM and give it new set of Mercury Racing designed, Edelbrock cast, aluminum DOHC four-valve cylinder heads, according to the company’s website. It’s called the SB4 7.0 and now makes 750 horsepower, which is a 245-HP jump over the 505 HP the original LS7 advertises, all without the help of turbos or superchargers. It redlines at 8,000 rpm and has a 11.7:1 compression ratio. On 91 octane fuel, no less. I will take mine in aqua. The outlet notes that, unfortunately, the modifications Mercury made resulted in an engine that isn’t as compact as the original LS. The SB4 is now three inches longer and two inches wider than the LS7. I’m sure you could still find room for it in your Smart ForTwo, though. Plus, it comes with a 12-month warranty. How could you lose? What is the cost of this wonderful thing, you ask? Is it a fair trade over a year’s worth of therapy sessions? That’s for you to decide, but it comes to $32,995 and that’s with the ECU and wiring. And you can hook it up to either an automatic or manual transmission. I know which one will bring a bigger smile to your face, though. Anyway, the next time you feel down, buy one of these engines, stick it in your car, go outside and floor it for a few hours. You’ll feel right as rain.